Average Height	: 17" - 19"
Average Weight	: 35 - 55 lbs. The Welsh Springer spaniel is an excellent dog that originated from Wales. It was first discovered some time before 1300 AD. The early details of the origin of the Welsh Springer spaniel are also the same with other spaniels that came from . During these times, the Welsh Springer spaniel was commonly known as a Cocking Spaniel. Kennel organizations were also not abundant, so various types of spaniels were often interbred. Later, two major breeds of spaniels came to the fore, and they were the Water Spaniels and Land Spaniels. The Welsh and English Springer spaniels transformed into independent dogs prior to the 20th century. 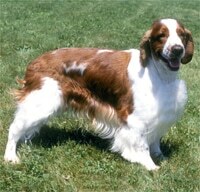 The Welsh Springer Spaniel is a cousin of the English Springer Spaniel and the Cocker Spaniel, which are the founders of all the English hunting spaniels. At one time the English Springer Spaniel and the Cocker Spaniel were born in the same litter. The Clumber, the Sussex, the Welsh Springer, the Field and the Irish Water all developed from the English Springer / Cocker in Wales, probably before 1300 AD. At one time all of these dogs were considered "Cockers" or "Cocking Spaniels" and were interbred. Hunters started to divide the dogs into categories of Land Spaniels and Water Spaniels and the Welsh Springer was labeled as a Land Spaniel. The Welsh Springer Spaniel was given the name "Welsh Cocker." In the late 1800s the Welsh was separated into a different breed from the English Springer. The Welsh Springer was bred to find and spring at the game. •	Compact, medium-sized working dog. •	Loyal, loves to please. •	Happy being part of the family, this dog is great with children, and loves to be included in activities. •	Lower energy than it's English Springer ancestor. •	Can be reserved with strangers, and should be socialized early. •	Sensitive to the tone of your voice, so train with patience and kindness. •	Love to hunt and have great skills in this arena. •	Good with other dogs and other pets. •	Does well in apartment lifestyles. •	Energetic, lively and loves to be exercised. •	a good jogging partner and loves long walks. •	Their coat allows them to fair well in both hot and cold climates. •	Grooming: easy to maintain with just a regular brushing. The Welsh Springer spaniel have been used for many years in hunting games, and because of this, they have been well-loved by sports enthusiasts and hunting game fanatics. A wide range of abilities and talents can be imparted to this dog including sprinting and brisk walking. The Welsh Springer spaniel is characterized as an extremely durable dog, and it can stay active for a long time without showing fatigue in all types of environmental conditions or landscapes. Its name is derived from the popular notion that this dog has tremendous aptitude in discovering games. The dog's tail shows signs of intense wagging when it spots a game. The Welsh Springer can be lost when left in open environments, but this can be avoided through proper and consistent training which must be started and managed at an early age. The very jovial and active characteristics of the Welsh Springer spaniel make it a favorite pet among families. Some of its well-known capabilities include tracking, hunting and retrieving. The Welsh Springer spaniels can live in various habitats, and they can survive in rocky areas and in places where vegetation abound. This dog is well adapted to land and water, but it still depends on the terrestrial environment for survival, where it is very adept in hunting. The Welsh Springer spaniel is always a jolly and affectionate type of dog. However, this dog is very much reserved unlike the English Springer. It can act on its own, but can be enthusiastic when in the company of humans. One thing the owner can do is to constantly interact with this dog to enable it to get accustomed to human contact. The Welsh Springer can be involved in family activities, and it can be trained to perform errands. The dog is very teachable, and more so from an early age. This dog can be sociable and friendly with other types of dogs, and they make great playmates for children. The Welsh Springer spaniel is also well known for its energetic ways besides its loyalty. They are seldom shy or aggressive towards their owners. The spaniel breed is well known for being lovable to all types of people, especially children. This dog can also easily adapt to new environments, but sometimes they don't really understand what their owners want them to do. Upon proper training, Welsh Springer spaniels can be taught to become very effective dogs. The coat of the Welsh Springer spaniel can be cleaned with ease through daily brushing. You can give the dog a refreshing bath using ordinary dog shampoos. The ears must be consistently monitored for the presence of foreign objects and infectious insects. The fur and nails must be cut regularly. The Welsh Springer spaniel is a very active and energetic dog that needs lots of exercise on a consistent basis. Without consistent exercise, this dog will become overweight and sluggish. Exercise for the Welsh Springer spaniel has to initiate a process of increasing the heart rate, stroke volume and cardiac output. The exercise also aims to improve the functions of various muscle groups of the Welsh Springer spaniel as well as its various organ systems. Upon continued practice, the exercise would allow the dog to perform at a higher physical level in terms of its daily endeavors, thus improving its overall health. Regular exercise will also lengthen the life span of the dog, and improve its bodily resistance against illnesses and diseases. Generally, the Welsh Springer spaniel thrives on an active lifestyle, and every aspect of its being will be enhanced by regular exercise, even the sheen of its fur. Exercise for the Welsh Springer spaniel must utilize large groups of muscles of the dog's body continuously . As a result, the dog's heart rate as well as its breathing is raised for a sustained period. Extra precaution and consideration should be done along the process of choosing the modes of exercise for the dog. Depending on the owner's objectives, various modes may prove to be beneficial to a particular situation. However, in general, it is a common practice to choose among several exercises. This method decreases the occurrence of injuries while it also reinforces conditioning, leading to the satisfaction of the dog. Although exercise really cannot be considered a technique, possessing the appropriate knowledge and skills of how an exercise program can be developed to improve the dog's health is still crucial towards the overall the happiness of the dog. The duration of training will depend on the dog owner's objectives and the physical condition of the Welsh Springer spaniel. Normally, ten minutes to one hour per training session is an acceptable range of time. If the goal of the training is to lose excess fat on the dog's body, then the duration should be longer, preferably 30 minutes to one hour. According to the latest research findings, the fitness levels of dogs can be improved even with a short training session lasting ten minutes, but training has to be performed more frequently, around 2 to 3 times a day, 5 days a week. But in order to achieve excellent general fitness for the Welsh Springer spaniel, 30 minutes is the maximum. Like any new training activity, it is normal for the dog's body to take some time to get used to the changes. These changes may be accompanied by soreness and stiffness as the training exercises progress. But this pain normally goes away through time as the body of the dog makes adjustments. Another disadvantage is the fact that the training exercise can cause injury to the dog. It is important to consult a veterinarian if you have any concerns about pain or injury on the dog. The most typical injuries derived from training of the Welsh Springer spaniel include joint and muscle strains as well as sprains. Serious pain should never be ignored. However, in order to decrease the risks of injury, getting a balanced training routine for the dog must be accomplished. Some people are finding alternatives for training their Welsh Springer dogs, but this is not a simple process. Alternatives for proper training are a relatively new approach, and they may not give immediate or spectacular results. Supporters of such alternative programs suggest a step-by-step process in which bright and talented Welsh Springer dogs are chosen to undertake more advanced training. But it may not be effective to force a dog to learn quickly as the results depend on the dog's will more than its ability to learn. As an alternative, dog teaching products can also be tested on Welsh Springer spaniels during training. Although many people believe that intense training of Welsh Springer spaniels is not proper, there is no problem as long as it is done properly. Without dog training, many important abilities of the Welsh Springer dogs would not be discovered and made useful to humans. Welsh Springer spaniels that are used for research and training are subject to various regulatory controls with aims to minimize animal pain and suffering. Although we cannot say that this holds true for every dog being trained, there is no better alternative at the moment. In this respect, it is illustrated that owners of Welsh Springer spaniels from different countries do not show the same level of dedication in caring for their dogs.